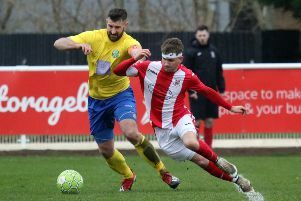 Banbury United boss Mike Ford was relieved to see his all but secure their Evo-Stik League South status. The Puritans beat St Neots Town 3-0 in Saturday’s premier division central clash and are now 12 points clear of the relegation zone. Skipper Ricky Johnson struck twice with Northampton Town loanee Joe Iaciofano also getting on the score sheet. Ford told Puritans Radio: “It was the right way to approach the game but we won’t play like that every week. It was a job well done and another clean sheet, we set the team up not to lose the game. “The players did exactly what we asked them to do in midweek, working on our shape, being compact and putting St Neots under pressure. We didn’t come here to chase the game, we just had to be very difficult to beat to get something out of it.